attractiveness are similar across different genders and cultures. A study published in 2008 suggests that symmetry is also important because it suggests the absence of genetic or acquired defects. Although style and fashion vary widely, cross-cultural research has found a variety of commonalities in people's perception of beauty. The earliest Western theory of beauty can be found in the works of early Greek philosophers from the pre-Socratic period, such asPythagoras. The Pythagorean school saw a strong connection between mathematics and beauty. In particular, they noted that objects proportioned according to the golden ratio seemed more attractive.Ancient Greek architecture is based on this view of symmetry and proportion. Classical philosophy and sculptures of men and women produced according to the Greek philosophers' tenets of ideal human beauty were rediscovered in Renaissance Europe, leading to a re-adoption of what became known as a "classical ideal". 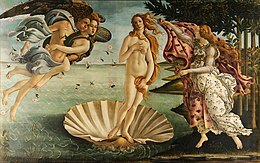 In terms of female human beauty, a woman whose appearance conforms to these tenets is still called a "classical beauty" or said to possess a "classical beauty", whilst the foundations laid by Greek and Roman artists have also supplied the standard for male beauty in western civilization. During the Gothic era, the classical aesthetical canon of beauty was rejected as sinful. Later, theRenaissance and Humanism rejected this view, and considered beauty as a product of rational order and harmony of proportions. Renaissance artists and architect (such as Giorgio Vasari in his "lives of artists") criticised the Gothic period as irrational and barbarian. This point of view overGothic art lasted until Romanticism, in the 19th century. In the Romantic period, Edmund Burke postulated a difference between beauty in its classical meaning and thesublime. The concept of the sublime, as explicated by Burke and Kant, suggested viewing Gothic art and architecture, though not in accordance with the classical standard of beauty, as sublime. The 20th century saw an increasing rejection of beauty by artists and philosophers alike, culminating inpostmodernism's anti-aesthetics. This is despite beauty being a central concern of one of postmodernism's main influences, Friedrich Nietzsche, who argued that the Will to Power was the Will to Beauty. In the aftermath of postmodernism's rejection of beauty, thinkers have returned to beauty as an important value. American analytic philosopher Guy Sircelloproposed his New Theory of Beauty as an effort to reaffirm the status of beauty as an important philosophical concept Elaine Scarry also argues that beauty is related to justice. what is the meaning of beauty ?